The US economy continued to strengthen in September leading the Fed to hike rates for the third time this year to an upper bound of 2.25%. The Fed rate hike, coupled with strong employment data for the month of September, pushed the 10-year Treasury yield to a seven-year high of 3.23%. Nonfarm payrolls for September came in at 134k, below estimates of 185k. However, the unemployment rate came in strong at 3.7%, the lowest level since Dec-1969, while the jobs count for July and August were revised upwards from 147k to 165k and 201k to 270k, respectively. Given the inverse relationship between bond yields and prices, an increase in yields lead to a fall in prices. 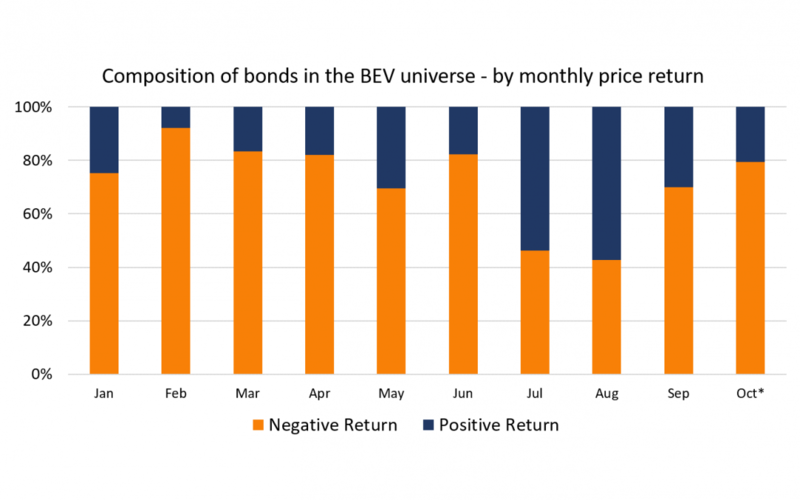 To see how bonds within the BEV universe have moved through 2018, we calculated the percentage of bonds with positive/negative price return – by month. As seen from the chart above, over two-thirds of the bonds in the BEV universe have yielded a negative price return for 7 of the 9 months in 2018 thus far. October is off to a sluggish start as well with 79% of bonds in the BEV universe in the red since the start of the month. The negative price return for bonds in the BEV universe can be attributed to the climbing Treasury yields and widening spreads. The negative price return has translated into a mark-to-market loss for all but two months in 2018 so far, as seen from the chart below. An interesting trend that we noticed was that bid-ask spreads widened in the same year-to-date period. The ridgeline plot below plots the distribution of bid-ask spreads for all the bonds in the BEV universe. The orange dotted-line marks the mean bid-ask spread for the BEV universe for each month through September. 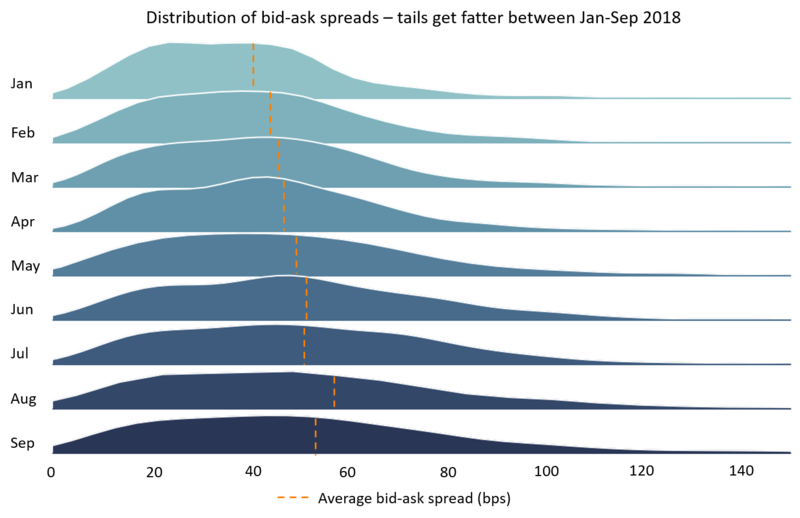 The widening of bid-ask spreads is evident from the rightward shift of the mean line and the thickness of the distribution tails on the right through the months. Turkish bonds recovered impressively in September after a sharp slide in August. The Turkish central bank raised its benchmark interest rate by 625 basis points to 24% on 13-Sep, in a bid to salvage the falling lira and prove its independence from the government. The central bank’s decision was well received by bond investors as Turkish bonds rallied by an average of 10% in September. Turkish bank bonds recovered most prominently, with some bonds of Yapi Kredi Bank and Akbank rallying by ~25-30% in September. 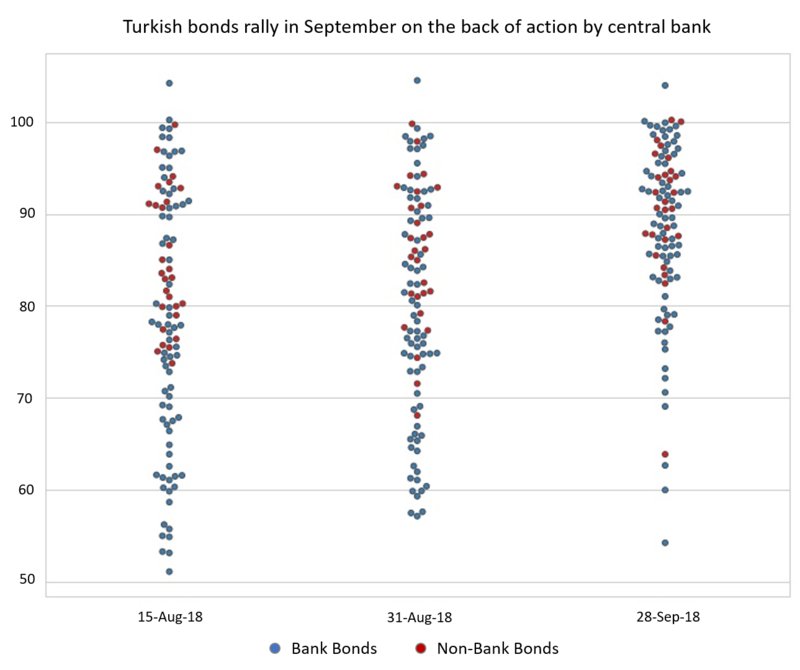 Turkish bank bonds were the worst-affected by the selloff in August, as documented in our newsletter last month. As seen from the table above, Turkish bonds were not the only bonds to recover in September. Argentine bonds recovered on news of the government negotiating a USD 50 billion credit line from the IMF. The IMF showed strong support to Argentina by increasing its bailout package to a record USD 57 billion – the biggest loan package from the IMF ever. The central bank took serious measures on its part by hiking interest rates to 60% – the highest in the world – in end August and holding rates at that level in its September policy meeting. Bonds of French supermarket chain Casino and its parent Rallye rallied in September on news of it securing a EUR 500 million credit line from five banks. This new credit line will help the company repay its upcoming bond maturities. Casino has also pledged to sell assets worth EUR 1.5 billion in a bid to cut down its mounting debt pile. 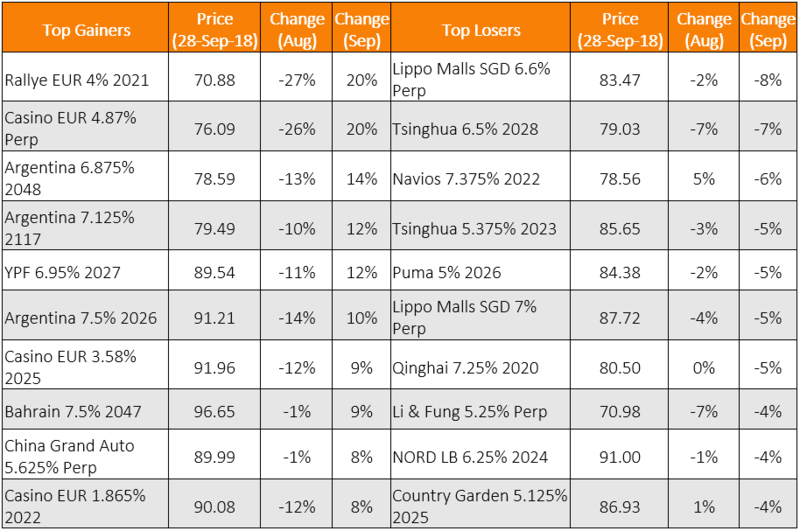 Lippo Malls’ bonds were under pressure in September after Moody’s downgraded sponsor Lippo Karawaci’s credit rating by one notch from B2 to B3. Moody’s also downgraded bonds issued by Theta Capital, a wholly owned subsidiary of Lippo Karawaci, from B2 to B3. Moody’s expects Lippo Karawaci’s operating cashflows at the holding company level to weaken over the next 12-18 months. This would make its ability to service its debt contingent on execution of asset sales. Moody’s expectation of negative operating cash flows at the holding company level is driven by (1) lackluster marketing sales of inventories; (2) a decline in asset management fees from the sale of Bowsprit Capital Corporation, manager of First REIT Limited; (3) a decline in dividend cash flows from its Singapore-listed real estate investment trusts owing to its reduced stake in First REIT and weaker dividends per unit from Lippo Malls Indonesia Retail Trust; as well as (4) higher interest expense on its US dollar debt as a result of the weaker Indonesian rupiah against the US dollar and higher cost of debt. Primary market issuance picked up in September with 58 deals amounting to a total volume of USD 25.8 billion (Asia ex-Japan G3 currencies). In comparison, the month of August saw 36 deals with a total volume of USD 17.5 billion. 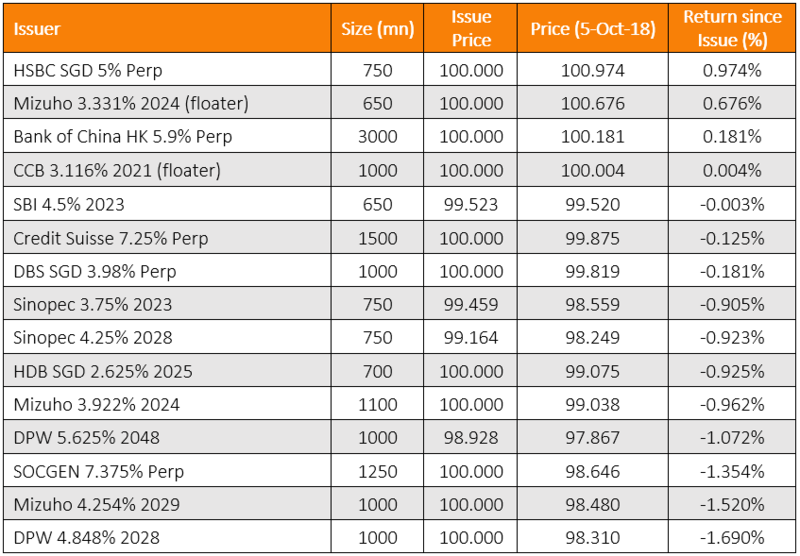 The Singapore dollar primary market saw 9 deals in September amounting to a 11-month high volume of SGD 3.7 billion, with banks and government entities dominating. DBS and HSBC tapped the SGD bond market in September with SGD Perps, following OCBC’s 4% Perp priced in August. Credit Suisse and SOCGEN priced USD Perps (Contingent Convertible or CoCo structures) at attractive yields of over 7%. Other prominent bank deals in September were by Mizuho, Bank of China, China Construction Bank and State Bank of India. We are delighted to announce that BondEvalue will be participating in the Swiss Fintech Day at Zurich on 16-Oct-18. Do visit our booth and meet the team if you’re in Zurich next week! Download the BondEvalue App for bond prices, new issues, news and portfolio analytics.